Mick Cottier from Australia hooked and landed his first Molokai bonefish today despite nasty weather conditions. This entry was posted on Wednesday, July 25th, 2018 and is filed under flyfishing. You can follow any responses to this entry through the RSS 2.0 feed. 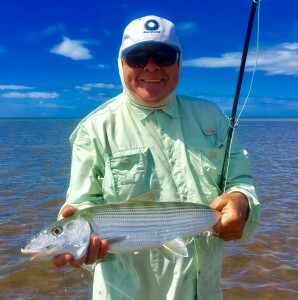 « Kevin caught his first Molokai Bonefish despite really windy and nasty fishing conditions.